A few people have commented on posts asking about offboard wiring. I use a daisy chained power supply, so for things I build for myself I rarely include a battery snap unless it's a positive ground effect which can't be daisy chained with more common negative ground pedals. This is a less common way of wiring the switch, but it's my favourite method now because it grounds the board input during bypass which will prevent noise bleedthrough that you can get with some high gain circuits. This version shows an optional switchable effect (such as a booster) before the main board. The main stomp will bypass everything, the second stomp will turn the booster on and off. If you want the booster after the main effect, solder the input side up as usual and take the main board output to the second stomp instead. If you want to include a battery snap there are other guides out there such as Beavis Audio's which is excellent. A small 5 x 2 piece of vero board is great for this, makes linking pins much easier or even adding the odd component to the pot if it would be convenient to. Another advantage to this is that the board seems to act like a heat sink so very little heat is transferred to the pot avoiding potential damage. Any queries then ask away in the comments. I've got to thank you for this one. I tried it and I love it. I don't know why but my build just feels more solid than before. I'm also started using the little vero pieces on the pots. It's a very nice little detail. I would like to see some other tips like these if you have any. Like how do you wire pedals up? What's the process? Tips on making it as solid as possible, etc. I have tried to do this with a 2.1mm DC socket and I can't get it to work.... Any help please. All works fine if I put a battery snap on. I am using metal socket and 9v middle pin, ground the one that looks second one down. Again please help.... I have been varnishing me tin for a week lol. Well if it works with battery but not with the power supply we know exactly what the problem is. You say you're using a metal socket with the centre pin positive, but what power supply are you using for it? If it's one you use with other effects then the centre pin is likely to be negative. Also he might be using a Metal jack instead of a plastic jack. IMO i think it was my mistake the first time that i used a metal jack and it shorted out to the 1590b encloser. Thanks Mate I will give it a try. Yes I am using my power supply I use for all my 3 pedals.. (Although after this I can see myself having every pedal I dreamed off, but could never afford). I sort of assumed that the center pin was live and the center pin on the back was also live. I will try it in th morn.... So whats the 3rd pin for???? Cheers Ivlark, thats pic is a big help..
and put the top ground to the bottom ground as you look at the layout. Then wired as above...The hissing sound does not go the lower you turn the knob, and it increases when I strum... Have I fried the transistor??? Question on the dual pedal layout. Any way of incorporating a switch that would change the order of the pedals? Say you have pedal "A" going into "B"...any way of adding a switch that would make "B" go into "A"? Check out Dano's solution to this over at Beavis Audio (great resource btw...). The Effect Order Switcher on this page,( http://www.beavisaudio.com/projects/Looper-Switcher/index.htm) you'll need to modify it slightly since it's designed as a switch for two boxes but the concept is the exact same. In/Out from A and In/Out from B controlled by a 4PDT if you want led status of configuration. You could sub a bi-color common annode LED from Tayda instead of using 2 separate ones. Hmm... I think we'll need a version with battery snap on it. The usual way is to take the battery + to dc jack's switching pin (usually the middle one) and negative to input jack's ring. Input jack has to be stereo to have that. That's the "industry standard" way, as it disconnects battery if a) there's no cable plug in input jack or b) there's dc plug present. So in a way, it is simple, but effective way to prolong battery life. hey mark...does the orientation of the 3pdt matter? I noticed on the beavis wiring diagram, the switch isn't wired the same way, can these be set up different ways? I dont know much about what each contact on the switch does and was just wondering. thanks. where can I get wires that are suitable for offboard wiring? preferably I'd like to use different colors to help keep things neat, and be flexible enough. Any electrical or electronic shop should sell equipment wire. Depending on what part of the world you are in (I'm not too sure about AWG equivalents) but here in the UK I use 16/0.2mm wire most of the time, or 7/0.2mm if there are a lot of wires and I want to keep the wire size to a minimum. For tagboard layouts I use something bigger like 24/0.2mm or even 32/0.2mm because I think that type of build suits thicker wires. For wiring pots I've also just bought a big reel of 20 way ribbon cable which I cut to length and keep in groups of 2 or 3s for the pots. That will last a very long time and is currently my favourite way of doing it because it keeps the wires neat, compact and together without having to think about it. I'm in the US. Thanks! The ribbon cable idea is great! I'll have to try it. I've got 5 builds lined up right now and not enough wire for two of them haha. This blog has been extremely helpful. My goal is to eventually understand what the different sections of a schematic do to get the sounds you want, and understand how to modify them or design my own effects. Is there any rule for the LED resistor value? also anyone has a diagram to show the LED wiring? Thank you. fill in the blanks and you're on your way. For the BOX OF ROCK you use dual effect or switchable boost wiring? I'd definitely used the dual effect wiring, then the SHO can be used independently which I suspect most people would want. Newbie question. I am at the point to start my first ever pedal and I hope you would be kind enough to answer. I have seen an other way of wiring the 3PDT, which also put the board to the ground when the switch is in bypass position. It is a schema from gaussmarkov. As it also seems to be logical, could you explain precisely what makes your proposal better, or what are the advantages in comparison to the other proposal. This one grounds the input of the board when bypassed too. All the switches work like this: http://mirosol.kapsi.fi/varasto/boxes_other/pots_switches.png - So all the poles (or columns) are connected up and middle in one position and middle and down in the other. But in general, these two wirings do exactly the same thing. Mark's (which i believe is the Skreddy way) just does it with one lug less - that gets grounded too. I'm a bit confused about how to wire the jacks here.. I can't tell where on the jacks the wires are going to, especially on the inputs.. Any help or further illustration would be greatly appreciated.. I LOVE this blog by the way. It looks pretty clear to me, the input tip goes to lug 9of the stomp switch which is also linked to lug 4. The output tip goes to lug 8 and all the sleeves are connected up with the other ground connections. ....and if you are unclear which lug is which on the socket, just plug in a guitar lead in and use a DMM to test for continuity. My apologies, I'm still a bit of a noob.. So nothing is soldered to the ring? Not unless you're using a battery, I don't use them so my layout excludes them and just uses mono sockets. 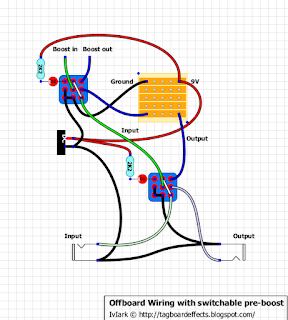 If you want to use a battery check out the offboard wiring layouts on General Guitar Gadgets, Beavis or similar. Don't be afraid to ask, most of us were asking questions like that, not that long ago ( ....and in my case, still am)! Mark's diagrams above don't use batteries so I think don't require the ring connected. If you do, then the ring would connect to the negative terminal of the battery(black lead). Doing it that way would disconnect the battery when is taken out. I don't use batteries either as they nearly cost as much as some of the circuits! Nice! I would totally prefer not to have a battery option! Think I got it now thank you so much! Hi people! I want to ask you something just for verification or an extra explanation: When I wire the pcb to in a box like shown above, I take just one ground wire from the pcb wire it to the source 9V or adapter and from there I connect all other grounds to the jack inputs, pots etc.?!. I'm scared that I wont get enough ground contact and that I'll have buzzing or something so I always take another ground wire from the pcb to the jacks- Is this good or bad..I usually use plastic input jacks with plastic screws so they have no connection with the box...And I want to ask another thing: Usually the wires from the source are rolled together for canceling potential buzz- Is there any need for other wires to be rolled up together in a pedal or just these? Thanks again Mark, i was troubleshooting a loud popping issue in my last build and in place of classic the pull down resistors, i tried your 3pdt wiring method... the pop is gone! I did this wiring for my Timmy I just built and all I'm gettin is hiss/static. It lights up and the pots control the hiss but no guitar sound at all. Nor is it bypassed through. 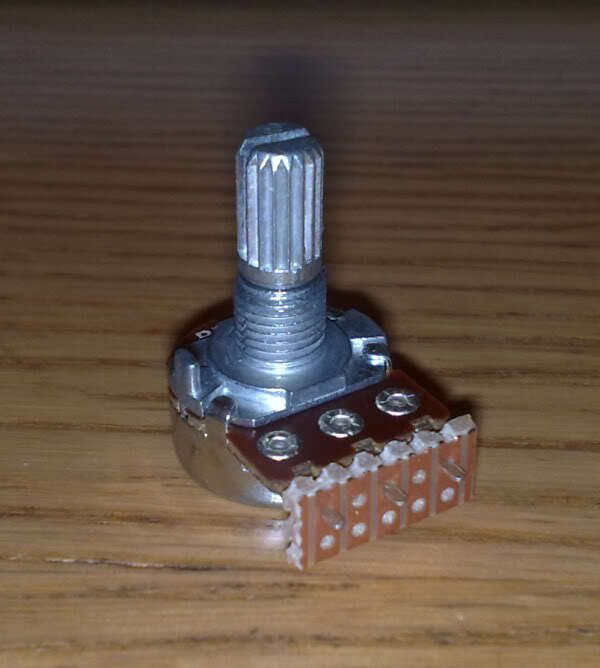 Another dumb noob question: The stomp switch has the lugs going horizontally right? I'm working on a Devi Ever Karaoke Party and it has two grounds on the layout, where would I attach the other ground to using this layout for offboard wiring? Whereever is easiest for you. 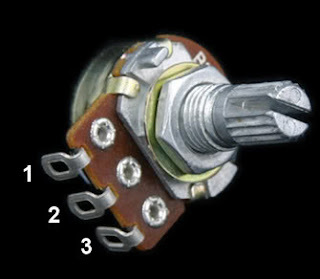 One of the jacks' sleeves or the dc jack ground or the footswitch. If you are talking about the ground wire coming off a volume pot on Mark's layout, you can even wire it back to the board, anywhere on the ground strip, say to the right of the 100uF cap negative lead. More of a curiosity, but how many pedals can you wire up and still get 9v going to each board? I was actually thinking of grabbing some noise layouts from here and making a console of sorts, and then there's the idea of combining multiple fuzzes. Thanks again for all the work you guys do btw. It all really depends on what kind of power supply you are using. If you are using a well regulated supply, it will put out nominal voltage no matter what the load. You only need to make sure that the supply can provide the current draw needed to power all your circuits and that you have adequate heat management for the supply. So this DOES work for positive ground effects? If not, would you just inverse the black and red wires from the battery clip? The way the effect is true bypass switched in is the same no matter whether the effect is positive or negative ground. That only comes into the equation for the LED wiring, and then you would just connect +ve to where you connect ground with the negative ground circuits (and the same on the circuit boards of course). I've used this method many times and it work perfectly. The one tricky part for me is fitting two wire into the DC jack. Like one wire going to the 9v on the board and one going to the LED. Is there a better way to connect the two. Maybe tin the tips of the wires. I ask because I building my next one for a friend and I want it to be as professional as can be. That would have been smart, I could have put the resistor on the board too, but I already cut the vero board to size. Can I just have two wires soldered in the same hole, so one goes to the LED and the other goes to the DC Jack but they are coming from the same hole? Sure thing, if it's easier for you to take two wires from one vero hole than to take two wires from the dc jack. It's all the same 9V. Move 9V potential to the top row, separate it from the pot, take one wire to led, one wire to previous 9V. I hope I didn't butcher it beyond recognition, I don't have photoshop on this computer. hey guys sorry but probably a stupid question but...i dont have any resistors here to limit the current for my LED until they arrive in the post (im building from the bitsbox kits so i have no extra anything) so i was wondering whether i could continue building pedals and wire the 3pDT switch in true bypass but omit the left hand side lugs of the 3pdt to treat it like a 2pdt and then add the resistor and LED at a later stage whenit arrives? Absolutely. The led circuit in that 3pdt setup is a completely separate circuit and you can put it in at a later time. I want to put two delay circuits in one housing but have a 4SPt switch for one and and a master footswitch for both (a dual delay). Would the switchable boost be the best way to achieve this? And what's a master footswitch? I'm just trying to picture what it is you want the switches to do...? Well in that case the third diagram may be what you need. Your "main" delay is the big board and the second delay can be introduced in front of the main delay ("boost" in the schematic). The main board footswitch turns both on/off, the left switch turns the second one on/off when needed. If you don't need led(s) you can get by with only dpdt switches. Second question: Do all pots have to be grounded? If so, where would the ground connection go? On the back of the shaft? (the smooth side that states the nature of the pot). Thanks in advance, I love this site. My "it's too early in the morning to be thinking of these things but here you go anyways" thought is that this may actually produce even more wires or longer runs, depending on your board design. Point taken. But, would it work? I'm a noob and I'm really asking more for my understanding really. I've actually done/do this. I was making a double pedal and I was running out of places to put the ground. So I thought of doing a "star ground" like I've done in guitars. Then I thought it would be easier if I did this with power too...so I did. Everything worked great and I found it much easier. As for it using more wire, I would say yes it does. But I think it is easier to do a neater job. I'm still very much learning all of this and trying to learn the art of NEATLY boxing an effect. Hello, where is the output on the board is it on one of the lugs from the volume pot? I get no sound from any build from this site, please let me know, thanks! it varies from board to board. sometimes it's a volume pot lug, sometimes it's taken from the board. Even completely disregarding these offboard wiring diagrams, if you connect your in/out jacks and dc power you should have the effect working. If they are not, you've made a mistake someplace. Do you have a particular build that's not working that we could take a look at? Hi I've just added the volume daughter board to my EP booster build, but I'd like to have it on a toggle switch so that I can have it completely out of the circuit when I don't need it. Which switch should I use, and how should I wire it? I'm assuming that it should be a SPDT or something like that. Anyway thanks for any advice and thanks for a great site. The third diagram on top of this page should be what you're looking for. Booster board on that diagram is your volume board. Have a very good Switches and Sockets blog which is really interesting and knowledgeable. I really appreciate you for this good work keeps it up. You can also find a very good blog at Switches and Sockets by Meteor Electrical. Which lug is which on the DC jack? 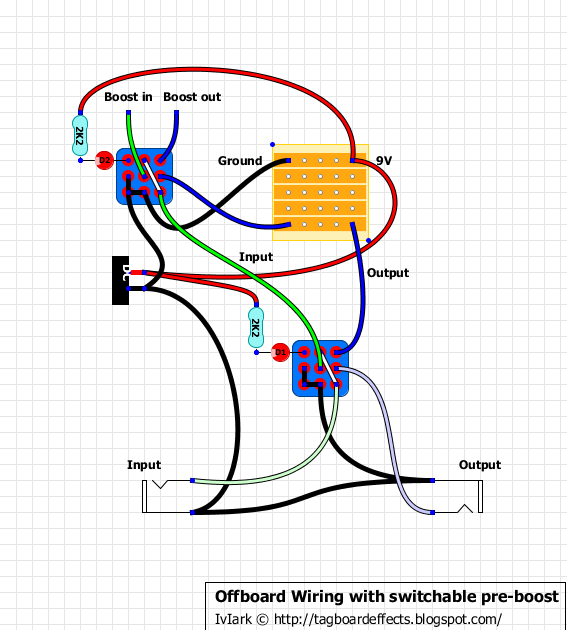 I've been using the Beavis diagram for offboard wiring. Is there anyway to get more visual for me? It depends, really... which dc jack are you using? is it switching or nonswitching? I don't know if anyone's thought of this, but why can't you use a 4PDT switch and the battery disconnect go to that instead of the input jack ring? So if you're using a battery it's only on when the effect is on. Would it create a popping noise? You'll almost certainly get a pop unless you could get a switch where the battery contact makes slightly before the audio contacts ("late break/early make" which I've never seen in a stomp switch). And you may also get a slight delay with some circuits before they come on. I think that there is mistake. LED - goes to 2k2 and + to switch? Mark, can you do me a favor and add to the offboard section a daughterboard that I can use to replace a capacitor on the main board? I'm picturing a "variable capacitor circuit daughterboard". I have found some schematics that show a pair of capacitors (one high value, one low value) added to a potentiometer to effectively do this, but I can't schematic to real word wiring (noob). Would it just be input from board to lug 1 and output to board from lug 3, and then just jumper lug 1 and 2 with Cap-A and jumper lug 2 and 3 with Cap-B? I have an old DOD envelope filter and I have located the cap that controls the decay. I could just swap the cap out. But I want to add a control pot to it. The existing cap is 10uF, which is a really fast decay. I've heard recommended 22uF. But a pot would be the best! Anyway, I can imagine making up a bunch of these "daughterboards with a pot" to have ready to drop into capacitor sockets when experimenting. Input from board to Lug 1, output to board from Lug 2. put the caps in like I said , between lug 1 and lug 2, and the other between lug 2 and lug 3. And lastly, jumper lug 1 and lug 3 together. Variable Capacitor...OK---I think I have this right, I drew it up this morning (see link below). I am going to make this socketed daughterboard with a pot. The only thing I am unclear on is how big the pot should be, or if it even matters. Also, I have read that there is a limit to the "smallness" of capacitors that this will work for, because the wiring itself will dwarf the capacitance. If anyone would mind taking a look at this and providing comments, I'd much appreciate it! OK, I built it, and it served it's purpose very well! I started with 10uF on the constant side and 30uF on the pot side. I determined that I liked the sound somewhere around 25uF. So I added another 10uF to the constant side (20uF total) and only put 10uF on the pot side. for fine tuning. Dialed it in around a 6. So I would like to be ordering up a 26 uF Capacitor. SO I guess I'll settle for a 22uF. Or put a 4.4uF in parallel with it. I then moved on to the smaller caps. 0.01uF is the stock value. I liked it around 0.024. But if I understand correctly, I need to dial it back a bit to account for the losses for these smaller values. I'll probably just install a 0.02uF, which, not coincidentally, is what I read was a common mod for the DOD fx25 caps. Mistake: Lug 1 should read Lug 3 to make the knob intuitive; clockwise to add capacitance. The one you are currently using is a momentary one and will not work. Yes, I don't know the difference between momentary and lacking or what was it's name...the thing is that Im trying to incorporate Milenium bypass vero that uses DPDT switch so that I can escape the popping of the led. The vero works well now but the momentary switch has to be pressed and held down so that effect work. Otherwise the effect is off and the led is shining. My point is- Is that a bad switch because the characteristics of the switch are ON/ON momentary DPDT switch or it has to be connected differently??? It's not a bad switch it's just the wrong type of switch. A momentary switch only works while it is pressed, when you release the switch it goes off again. A latching switch ( which is the type you need ) goes on when you press it and doesn't go off until you press it again. Thanks mate, now I'm enlighten but with 6 bucks less in my pocket :) I'll by the other type and I think it will be fine...the bad thing is that I'll have to wait for two weeks :((( THANK YOU! Okay, i've got a couple questions. Are you just using two mono jacks because there are only two lugs (or whatever their called) on each jack? Where's the third lug on the DC jack? 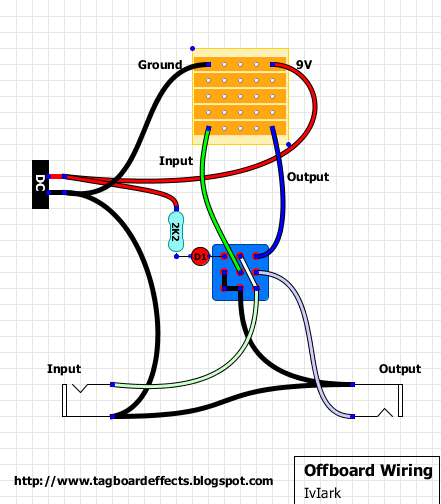 All of the other wiring diagrams i've seen (like the ones at generalguitargadgets) seem to have two grounds coming off of the board. How would I use one of these with one the vero layouts here, which tend to have one ground off of the board? I think I figured it out. The second ground shown in a lot of other diagrams comes from one of the pots in your vero layouts and goes to the sleeve of the input jack? 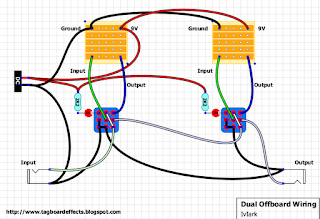 Hello, I am trying to build the gaspedal dumbbell pedal with the dual effects offboard wiring diagram. this is my first pedal so I'm a tad nervous about it. but in the diagram it shows each pot going to a vero board so here's the question. are these separate boards from the main board or are they the same or different boards entirely because I see a ground and a hot wire connecting the two together so I'm a bit confused. any help at all would be greatly appreciated. thanks. Ok that makes sense, what about the pre-boost diagram boost out boost in? I have another question. sorry if this is nubular but on the boost and normal diagram where it says on the boost out and boost in where do those wires connect? I've rewired this dumbbell up 3 times and still nothing works. Knifed between the strips several times, troubleshot the board and as far as a noob can tell it works fine using my multimeter. so assuming it's offboard. just took everything out of enclosure and wired it again still nothing. regular stomp turns led on/off, boost led doesn't do anything although I hear a popping sound when turning both on and a slight hissing sound when both are on. no sound comes through in all bypass mode so I have no idea what to do. anyone plz help. thanks. I'm confused Kody. Are you building the dumbbell as a single effect now? Or are you still putting in a dual effect box with some other effect. or with a booster circuit? For a first project, you may be going a little too complicated. I'll bet you have a pretty high IQ, because this stuff on paper looks like childsplay so you jumped right into an ambitious project. That's how I was. But I haven't have anything fire up the first time yet. Still waiting for that buzz. But experience teaches you things that even the brightest mind can't get, even from apparent complete understanding. I can build a puzzle. Fast. But this new hobby is more than just a puzzle, as I am finding out. If no, then use Mark's diagram at the VERY top of the page. After you get some experience, you can use the battery clip version from that Beavis link combined with Mark's switching method that grounds the board on bypass (again, at the VERY top of this page). That's what I did with my Arctic White Fuzz. 2. Gain a full understanding, with parts in hand and an ohm-meter, of the DC jack power source switching. When a 9V plug is inserted, it disconnects the ground wire coming from the battery. So your battery is off if you have an external power plugged in. You know this from your store bought pedals. But wiring it takes some thought! Use your meter to check the lugs for continuity before you soldier anything. Experience! It's better than just following the diagram. 3. Gain a full understanding, with parts in hand, of the Stereo Input Jack "ground switching" to control on/off. If wired correctly, the mono guitar plug inserted into the stereo input jack connects the ground to the power supply. Without the plug inserted, the ground is disconnected, and your pedal is off. You know this. But wiring it takes some thought! This switch doesn't care whether the power is from battery or plug, because THAT switch is upstream of this switch. Plus, it is only the ground that is getting broken. 4. Try wiring the board up with alligator clips and a battery wired directly to the board. This takes a lot of the potential wiring problems out of the troubleshooting equation. I wish I had done that. I fried a stompswitch from too much heat and I knew it, but was too stubborn to admit it. So I trouble shot the whole board to avoid having to de-solder the stomp and put a new one in. Denial never fixes anything! Ooops, correction on my item #2 above: The DC plug disconnects the +9v lead from the battery, not the ground. I was mistaken the first time when looking at the offboard wiring page. I'm building the booster. I originally saw the two switches without reading what the names were closely. my bad. and thank you so much. I don't have any room inside the chassis to fit a battery. but I have voodoo lab power supply mounted under my board so I'm good there. that's a great idea just trying to wire it up as single first. never woulda thought of that! makes me feel better to know that I'm not the only one who can't get it right the first couple of times. I have another inquiry. on the gaspedal dumbbell schematic how there are the 11 cuts I cut them backwards cuz the copper strips are on the bottom from where you put all the components through so I basically have the whole board wired up backwards. I noticed this a few days ago so I took the ic off and turned the board over and soldered it to the strips themselves so pin 1 is still going straight to the diodes and pin 4 is ground and pin 8 is power so everything should be wired correctly respective to where is should be. but to avoid complications should I make another Vero or do you think it's fine as is? How would I just wire up one effect since the board is made for a boost and od? Would I just wire up the boost? Since you have the IC flipped proper, I don't think it will be a problem. Just make sure you get the diodes polarity correct. You basically have to work outward from the IC instead of from "left to right" like reading. I use a red sharpie marker to mark the copper. Then I flip it over and poke a resistor through the cuts and mark the other side as well. This side should then match the layout. That's like a little check. Checks and balances. Then I place all of my components "relative" to where the cuts are. Some people number and letter the rows and columns. I don't like that, because if you get off, you won't know it. Everything for me is relative to each other. "two up and 1 over, straddle 3 holes downward." Stuff like that. work your way around the board and if there is an error gap when you get back to some previously placed component, you have a problem. Again, checks and balances. Another issue with soldering direct to the board, make sure your connections are good. A dodgy connection on an IC will drop the output 90% for sure. Oh, I just looked at the vero. It has the second switch already planned in it. So you are going to basically wire it up as a single effect (top of this page) and then follow the instructions in the gaspedal layout for adding the 2nd switch and 2nd LED. That layout has the resistor for LED 1 already on the board, so you can ignore that 2k2 the offboard layout above. Like I said, this one is a little confusing for a first build. Without a battery option, you made it a little easier, anyway. Tip: See above where it has a DC box, and a 2.2 resistor into an LED and going to the stomp switch? That DC is already on your board. So is the resistor. so LED1+ goes to that spot on your board, and LED1- goes to the stomp switch as shown above. LED2+ has nothing to do with the Offboard general instructions above. Neither does the extra stomp switch. They are covered in the Dumbbell layout. Mono321 you totally just opened my eyes! I see it now (or at least I think I do). I never woulda saw that especially for a first build. thank you sooo much! I have another question. would I need to connect pins 2, 3 and 6 and 4 and 9 on the second switch included on the board? No! Just connect 1 to 4. That way you only need 1 wire from the board where it says "Sw1 & SW4"
No, just connect 1 & 4. Run one wire from your boards "Sw1 & Sw4" spot to either 1 or 4.
no. just 1 and 4. No worries bro! Thanks for the tip! Good news and bad news! Good news is now the LEDs look normal before they were blindingly bright to where they were discolored and in bypass mode I can play and signal goes through and when I push boost down I can still play but no.change in sound that I can hear yet. when I push bypass the signal cuts off. been troubleshooting and discovered most of my pin connections were dodgy so I soldered those again and they now (from what I can tell) have proper voltage running to them. still not much changes from before although the boost sounds a little better. just for confirmation on polarity issues side of capacitor with negative side or rectangle side goes to ground. clipping diodes the side with black ring is negative correct? I'm not sure what else it could be unless I have a bum part somewhere. I could have a piece of solder bridging somewhere along the strip. seems unlikely but I'll run a knife along it again just to make sure. up at very top single effect offboard (the one I'm working off of now) has ground up at top left, 9v at top right, input bottom left and output bottom right. I wired it up that way on the dumbbell board but that puts input and ground together. that's right....right? Is it possible I damaged the ic by soldering it, then de-soldering it, then soldering it again? Should I have used a dip or dil? And would it matter if it was a ne5532 (A,D,P,etc) or just ne5532 For the dumbbell? Sorry for all the questions, I just got a new job so I haven't had amy time to work on it lately. Yeah, ALWAYS use a socket for IC's. Unless you are mass producing 500 pedals. LOL. Very possible that you killed it. the letters at the end won't matter in terms of if it works or not. Some say they can hear a difference in tone, but I can't. I'm planning on using the 5mm ultra bright blue resistor from bitsbox for a tubescreamer build. What kind of current limiting resistor will I need? Is 2k2 good or not? My feeling is that 2k2 is just not enough resistance. I can't even read the knobs it is so bright shining in my eyes! And I am using 3mm LEDs. I have liked 4k7. I have also heard of people using a trimmer for the LED. haha I think I am going to put a trimmer on the breadboard to dial each color in and just get the value using the ohm-meter. Write it down and label each bag. What about an order toggle switch in the dual offboard wiring to change the order in which pedal comes first? I'm semi new the game. Anyone help? Which way do you think is best for dpdt switch with led? In the second one the effect input is allways wired to input jack. What will that do? What is "D1" in the top picture next to the 2K2 resistor? Thanks! The indication LED of your choice. Can someone please help me? Is it possible to use a foot switch to switch between two gain/volume setups with LEDs? I want to build the Tech21 XXL with two channels. The LED anodes to be connected to 9V. Lugs 1 and 2 of both Drive pots will go to the Drive1&2/Tone 3 connection on the board. So with one stomp, one Drive pot and LED are in circuit, with the second stomp the second Drive pot and LED are in circuit. Doing this with two volume pots is a little more complicated because you would really need two poles for the volume pots. One for volume pots lug 3 and one for volume pots lug 2. 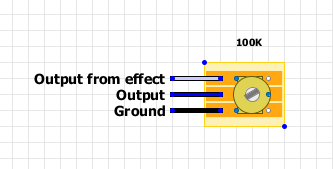 Only doing one lug like with the gain pot will cause problems because part of the other volume pot would still be in circuit with an active path to ground which will variably affect the resistance of the pot you want in circuit. So you could do it, but you'd need a separate 3PDT stomp just to do the volume pot with LED indication. I think i got it now... I need one pole for the tone, two for the volume and one for the LEDs. You just need to type "yes" if I'm correct! And thanks for the quick reply by the way! You really got me back on track! I think I just figured out a way of doing this with a 3pdt. By switching the LED and Volume 1 on the same pole. I don't know if this will result in any "poppin'". But it's worth a try. You don't need to switch the Volume 1 connections, they can both always be grounded. In fact if you switch them you run more of a risk of introducing noise if the ground connection makes slightly later in the stomp switching than the signal input at Volume 3. I was wondering how this looks on a board like the Devi Ever OK with no IN/OUT on the board. What do I do with the Input/Outputs that attach from the 3PDT switch to the board? I'm used to them being on the board, and this build has control 2 to input jack and volume 2 to output jack. If you don't see the input and output on the board, then you'll see a description of how they are attached in the notes of the layout, as you'll see at the bottom of the OK layout. Just to confirm, the notes say where they attach on the switch, not to the tips of the jacks (my initial thought)? I.e. control 2 to center lug and volume 2 to upper right lug, per wiring diagram? The tips of the jacks don't attach to the board except in very uncommon circumstances, like when the effect has a built in bypass buffer like the recent Buf V layout and when that is the case, again it will always be mentioned specificially in the layout and/or in the main post. For all other layouts the socket tips connect to the switch on the lugs shown in the offboard layout above. Then the board input and output wires go to where you are instructed in the layout. Either an input and output connection directly on the board, or in the case of the OK, Control lug 2 and Volume lug 2, because you have pots before and after the main board. I am trying to finish my first pedal project. I'm trying to make the one knob fuzz but it does not have an output sign of where should i solder on the board? If you're looking at the Zendrive layout, output is from lug 2 of volume pot. A lot of the pedals here follow that convention, so you will see it often. It also mentions that in the notes below the layouts if that is the case. The graphic is a visual representation of any circuit, the switch and offboard wiring are the important things. As long as input, output, 9V and all grounds are connected in the correct places as per the effect layout, then it will work fine for all effects on this site, other than the ones with specific wiring of the stomp like buffered bypass effects, but they are always mentioned in the layouts. For the Dual Effect Example, I was thinking of trying to use a single RGB LED, with four legs and common cathode. One switch would turn it red, the other switch green, and both switches turned on together would turn it blue. Is it possible? I imagine it would need a relay or something, maybe? You'll want the LED to have common anode. That way you can have the anode at +V and two cathodes for separate switches. If both of the circuits were positive ground fuzz faces or similar, the you could use the one with common cathode. Thanks. I don't mind which the common is, I haven't ordered it yet, so I will just buy whatever will work. I just need to find out how to make the idea work. Well. It works just like i said. I've done it myself a few times. Think of the three cathodes as separate LEDs. But instead of three different anodes you have only one. So one resistor from the supply to the anode - then the two chosen cathodes to each stomp switches lug number one. In some cases i have needed to add another resistor between the cathode and that lug for some colors, as the brightness isn't even on all three. Other option is to feed the +9V straight to the anode and use suitable resistors between cathodes and switches. I have a feeling I am being particularly dim here and not seeing something obvious. So, say green cathode goes to lug one of switch 1 and red goes to switch 2. Where does the blue cathode go? With other trash to the landfill :) I does not need to be connected. In fact i've snipped the unused leg off completely for the color i'm not using. Ah, no, the point is that I want to use it. I want the red to work with one switch, green with the other, but if both are on I want the blue to glow instead. However - if you do that the way i proposed, you'll have both, red and green lit at the same time when both effects are on. I was lying in bed this morning when the idea popped into my head. I lay there, wooly headed, trying to think how I could make it work. I put my frustration down to having just woken up. But the more I thought about it as the day went on, and all the Googling coming up short, I started to realise it might be a bit more difficult than I first imagined. You got me a bit interested, so i went on to read more about logic gate examples. CD4081B has four gates, which means eight inputs. Some Boolean algebra is needed to create a circuit that would do that. That'll mean a circuit at least a size of Red Llama :) And i'm not sure if the outputs are enough to actually connect the LEDs. If not, then that configuration will need three relays to take care of the connections. So anyway. I think you'd be better off by just using the switches to do simple mechanic LED connections. Thanks for your help. I have looked into it a bit more and given the idea up. I haven't used logic gates since I was in college, 22 years ago, and I seem to have forgotten more than I ever actually knew in the first place. I am going to have more difficulty getting everything in there as it is, certainly no room for another board. And I have decided to add a toggle switch for order switching, too, which will just about fit because I am only going to use one LED. I'll be doing what you suggested, using just the two colours, red and blue, that way it will turn purple when both are on, and I like purple. I've just finished my Wampler Euphoria and I think I did everything listed here. The pedal works fine but the LED doesn't light up. I've also noticed that when I pull the power supply the LED blinks. I've used a 500R resistor to limit the current. Is this the problem? I recently purchased the mxr phase 45 kit, I have had no real problem with the board its mainly the off board wiring im struggling with. I have searched and looked at forums for how to wire this. The kit was supplied with a switc that has 9 lugs, as far as I can tell a 3pdt. I can only find wiring methods that include an LED (which wasn’t in the kit). Wiring it without the LED uses a 6 lug switch. I have tried to wire it up and include a battery snap. When I plug in I get normal guitar tone, hit the switch and no sound. If I take away the battery I get normal guitar tone, hit the switch and I get slightly quieter normal guitar tone. Realistically how bad have I ballsed this up and is there a picture/guide on how to wire these things up (I have looked at the guide on tagboardeffects and on beavis audio) I literally need the simplest version as ive little experience with these things! How exactly does the boost get 9v wired to it? run another wire from the 9V lug of the DC jack to the boosts board. What is the real changes that I need to do if I use a Positive ground circuit ? I need to change the Led polarity: plug the positive led polarity on the 3pdt switch, the negative led polarity in the resistor and the resistor in the Ground of the Power supply Jack. From the power supply jack is necessary to plug the ground in the place of the +9V of the circuit board. The +9V of the power supply jack will go to the Ground of the circuit, to the sleeve of the input jack, to the sleeve of the output jack and, finally, to the 3pdt. Or for simplicity, Change the black wire with the red ... And do not forget the Led polarity ! I think it is the way to use the positive ground with this offboard wiring. If I made any mistake, please correct me !!!! Hi mark i made a multi fx using your layout, plus a power filtering daughterboard right in front of the 9v dc in. But the effects appear to all be switched on, if only audible when i stomp on their switch...what i am trying to say.. One of the 3 fx is a magnavibe and i can see the light flashing even when the effect is not on. Is it proper like this? I also have a repeat percussion in the multifx, and i can hear the tick bleed even when its switched off. I know the latter one is a bit of a pain in the neck, but is this how the multi fx outboard layout is supposed to work? Yes it matters. Lugs horizontal. Got it now, thanks so much! i have got a wooden box and i want to power-up 4 effects. is it ok to the duplicate the effect on the right-side of the "Dual Effect" Example? and yes, i am a newbie. i m gonna build my first pedal and i have one problem. I dont know the type of the footswitch i need to buy. I went to my local shop and he didnt know anything. Can you tell me the exact model that i need to buy? Is there a preferable way to wire DPDT foot switches to work with the layouts on this site? Thanks in advance. Have anyone tried to use flat cable (as the one that is used on pcs) to wire the pots to the board? I really appreciate your site. I have learned a lot. I am wondering how to put multiple effects into the same enclosure (like a Pete Cornish type board) and make it sound good. I want to put the Cornish buffer----G2---SS2---Brian May boost and the Neptune Delay all into the same enclosure. Can you please assist me with how to wire this? Any assistance would be greatly appreciated. Thank you for the site! 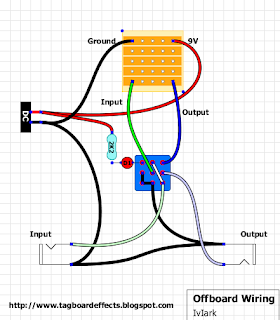 Question: is there a way to do stereo ins and outs with this offboard wiring? I'm wanting to build a buffer/clean boost with stereo ins & outs to put at the end of my pedal chain. Thanks I advance!! Quick question, for example in the Naga Viper Heat 1&2 that are going from just one place in the board. Do I need 2 different cables or shoud the pot tags just be linked? Have I made mistakes or is it correct?? Nobody to help me? Please...! But I lost the link and cannot find it any more ! Do anyone has an idea where I can find a layout explaining how to make it ? help please!! I am begging you - I have a youtube video uploading now with my build up close trying to troubleshoot. I am guessing it is in your DC adaptor where you probably tried to build the battery saver. A lot of people (me included at first) don't realize the "ring" in a DC adaptor changes state whether or not there is plug inserted (I forget what it does, but I think it is open normally shorts to ground when you insert a plug). Just make sure that is wired correctly so you are not grounding your VooDoo or something like that. Another test would be to take out all the battery connections and see if the Voodoo works. That's really a good idea. Thanks for sharing this useful information with us.You can contact Precision Drawell Pvt Ltd website for Steel Fibres For Concrete. if i want to do a three effect box i would do the same as a two and just continue along correct? Yep, just make the output of each switch go to the next switch input. I'd like to build a AB box with two inputs and only one output. How could I wire it using the 3pdt ? Is there any schematics ? that's super easy. 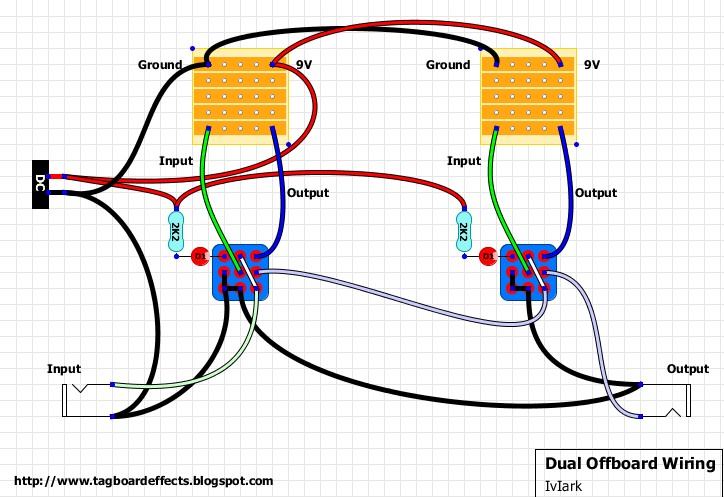 here's the setup for an A/B/Y looper, but for 5 input and 1 output. you can do the same thing, just only use 2 switched. personally i like the one with the buffer that way you ensure signal integrity. Hello Zach, Thaks for the sites. But I am thinking in something easier. Two inputs with atenuators pot. well the pots are simple voltage diverters, volume 3 is input, volume 2 is output, and volume 1 goes to ground. follow the 2nd link, just add the pot in between the input in the switch. I am going to build this one and after that I reply here. we have great expertise inStereo fitting in Bury thanks for helping post . . . .
thanks for these layouts -I am totally inspired to try and build the full tone fat boost. First ever pedal build needless to say...as this is one big learning curve. Is the D1 shown on the off board wiring refer to a LED Diode? Does someone know how to wire a dip-switch to change between two diode configurations? The plan is to use two 1N4148s in parallell, and the switching option of having two germanium diodes in parallell. I am buildinga COT 50. Hey, i wanna know what is the "side" of the 3pdt switch? Is it the same in this project? when you look at the switch the lugs should be horizontal, like "option 2." this and the looper are not the same thing. this is the wiring you will need to use to wire every pedal as true bypass. when you look at a layout, you'll notice there is nothing showing the stomp switch to turn it on. that's where this comes into play. the looper that you linked to on the other hand is an effect that allows you to create multiple pedal chains that you can switch between. the idea being that if you have 3 pedals on for 1 song, and 3 different pedals on for another, the looper allows you to leave everything engaged, but only in your effects loop when you hit the switch on the looper. think about it as a channel selector switch on your amp. Oh yes, thank you! When i said about the same as the looper project i was just talking about the side of 3pdt switch, not the funcion :) but thanks aswell! I tried combining Vemuran Jan Ray and an EP Booster (Briggs modded) using your Dual Effect wiring. They each work fine separately but not together though. The output drops significantly and becomes muddy when both pedals are engaged. The EP's gain knob also ends up giving the highest output (although still very low) when turned up about halfway, then tails off as the pot is turned to either end. Does anybody have any idea whats going on?